Orion RockStable pads. Illustration courtesy of Orion Telescope. These are a set of three black, heavy-duty plastic (Delrin? ), 1" deep cups filled with a visco-elastic material that is supposed to neutralize vibrations. There is a slightly dished and ribbed, hard plastic disc in the middle of the visco-elastic stuff where you place a tripod leg's foot. Similar anti-vibration pads are sold by Meade, Celestron and probably others. 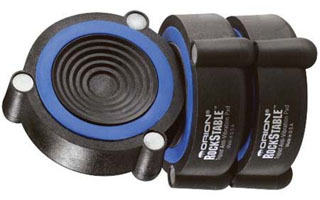 The Orion RockStable anti-vibration pads measure about 2-15/16" in diameter and have three small, rounded feet around the perimeter of each pad. The Orion visco-elastic stuff is blue. (Meade's anti-vibration gel is also blue and Celestron's is orange.) The Orion part is #05155 and the 2009 price for a set of three is $64.95. I had been curious to see if these anti-vibration pads worked. I occasionally mount my Celestron Omni XLT 102ED f/8.8 refractor on a Celestron Heavy Duty Alt-Azimuth (AZ) tripod to use as a quick look scope. This tripod and AZ head is basically intended for refractors no larger and heavier than about an 80mm f/11, so it is vibration prone with my larger 4" scope attached. Focusing the scope on this tripod produces irritating vibrations that make it hard to achieve precise focus, even though the scope has a smooth Crayford focuser. Previously, I had tried suspending a 7-pound sandbag from a clip-hook beneath the H-D AZ tripod to see if that would help stabilize it, but I couldn't see much difference. Astronomy and Photography Senior Editor Gordon Landers loaned me his RockStable Anti-Vibration pads for this experiment. Gordon had told me that he had briefly tried the RockStable pads with his Stellarvue SV102ED scope and M1 mount and not noticed an appreciable difference, but had not done any further experimentation with the pads. The first clear night found me at the end of my nice, level, concrete driveway with the aforementioned Celestron 102ED telescope and tripod and all the surrounding lights shut off. My test procedure was simple. I aimed the scope at the North Star (Polaris) and centered it in the viewfinder, viewing through a Celestron X-Cel 18mm ocular, which is physically rather large. I then repeatedly gave the focuser knob a fast ¼ turn to throw the scope out of focus and carefully refocused, noting the amount of vibration and the time it took to dampen. When I had a feel for the basic system, I added the Rock Stable pads beneath the tripod legs and repeated the same test several more times. Frankly, I could not see much improvement. It did not seem any easier to focus and the vibration from focusing seemed to take about the same amount of time to dampen. This was discouraging, but not wholly unexpected. I mean, what is needed is a heavier tripod and head, so how much difference could a trio of 4.6 ounce pads make? My last experiment was to add the previously mentioned 7-pound sandbag to the tripod, with the RockStable pads in place. Eureka, the system still vibrated while being focused, but less, making it easier to focus. I had no way to time the vibration-damping period, but it seemed quicker, maybe only half as long. This was, of course, a subjective test, as I had no instruments to measure and verify my impressions. My conclusion is that the Orion RockStable pads do help dampen (but not eliminate) vibration, at least in some circumstances, if the telescope plus mounting system puts enough weight on the pads. (You can see the blue gel-like stuff sort of bulge around the edge of the center dish if you push hard enough with your thumb, but you have to push pretty hard.) One customer's review of the RockStable pads (written by James W. Dolfi) on the Orion web site commented that the vibration dampening was excellent, but the elastic stuff extruded from the cup after a couple of hours use under his over 140 pound telescope/mounting system, so there is apparently a maximum as well as a minimum weight for these pads. My telescope and H-D AZ tripod weigh around 25.5 pounds, according to my bathroom scale. Add the 7-pound sandbag and the weight would be about 32.5 pounds, at which point the RockStable pads seemed to have some beneficial effect. It would be nice if Orion (or any of the other brands) specified an acceptable weight range for pad effectiveness, but none do.